Louisiana Senator Huey Long allegedly said: “When Fascism comes to America, it will be called anti-fascism.” We are seeing that in these Antifa groups today. They label everyone they don’t like as “fascist” and use that to justify their own violent actions. Now, Antifa is putting Immigration and Customs Enforcement (ICE) officers and their families in danger by publishing the names and addresses of ICE agents. Antifa members claim that their activism poses no threat to anyone’s life. So why are they publishing the home addresses of these officers? What good comes from giving this information to the public? Regardless of where one stands on the border, it is fair to say that the spouses and children that live with these ICE agents are innocent, and do not deserve this unwarranted attention from radical leftists. Antifa’s recent activities are alarming. They have graduated from protesting conservative free speech events, desecrating statues and private property to endangering the lives of those they disagree with. I saw a picture in an online paper last weekend about an Antifa demonstration against Christian holding a prayer rally in a Federal plaza (since when was Christianity fascist? Their true colors are shining through) turned violent in Portland, and several of the the male terrorists were wearing full-length black leather trench coats and jack boots. I instantly thought (looking at the picture before reading the article), “OMG, what are SS stormtroopers doing in 2018?” Seriously, who wouldn’t come to a similar conclusion? So, YES, they are domestic terrorists…they were shooting fireworks at police officers and throwing rocks and bottles. What I can’t quite grasp is do they understand that they are dressing like the SS–an elite, private Army who each pledged a blood oath to Adolph Hitler, while simultaneously accusing others of fascism? Is this some kind of dark amusement to them or are they really that stupid. I think they are really that stupid and indoctrinated. And dangerous. Protesters today like to evoke the words “Hitler’ and ”Nazi’ in their protestations when in fact it is they who are the real Nazis. They liked saying it under Bush, though I could never see the comparison and now they are doing it ten times worse under Trump. The liberal media has declared all-out war on President Donald Trump, evidenced by their incessant and self-righteously indignant negative coverage of virtually everything he says and does. The latest outrage for the virtue-signaling liberal media is the “zero tolerance” border policy — based on court precedent set in 1997 and clarified in 2016 — that results in illegal immigrant families being temporarily separated when detained and processed following illegal entry into the country. There’s just one big problem— the separation of illegal immigrant families at the border didn’t start with the Trump administration, but occurred under the past few administrations as well, including that of former President Barack Obama, but that didn’t stop the liberal mainstream media from blaming Trump for it. If they don’t want their families separated then don’t come in here illegally. Someone is going to get killed by their hateful and incendiary rhetoric and it will be on their heads. We are coming close to that now. Recently has been actor Peter Fonda, Mr. peace and love himself, emerged after about 40 years in obscurity with an enflaming tweet written in bold, capital letters which denotes shouting like a raving lunatic which has since been deleted saying “WE SHOULD HACK THIS SYSTEM, GET THE ADDRESSES OF THE ICE AGENTS CBP AGENTS AND SURROUND THEIR HOMES IN PROTEST. WE SHOULD FIND OUT WHAT SCHOOLS THEIR CHILDREN GO TO AND SURROUND THE SCHOOLS IN PROTEST. THESE AGENTS ARE DOING THIS CUZ THEY WANT TO DO IT. THEY LIKE DOING THIS. Fonda suggested that Trump’s youngest son Barron be kidnapped and locked in a cage with pedophiles, called for Department of Homeland Security Secretary Kirstjen Nielsen to be beaten and raped in public, demanded White House press secretary Sarah Huckabee Sanders’ children be taken away from her and called for the stalking and harassment of Border Patrol and Immigration and Customs Enforcement officials, as well as their children. Where are all the libs that are supposed to be so protective of women and children? Melania notified the secret service, and afterward, Fonda tweeted an apology. “I tweeted something highly inappropriate and vulgar about the president and his family in response to the devastating images I was seeing on television. Like many Americans, I am very impassioned and distraught over the situation with children separated from their families at the border, but I went way too far,” Fonda said in a statement. You were being manipulated by the destroy Trump media Peter, but you wouldn’t know that since you probably agree with them. In true Nazi fashion, these protesters deny people their freedoms and disturb the peace of private and public citizens. They recently went into a restaurant where Homeland security secretary Kirstjen Nielsen was dining and started yelling ”shame on you” to her. They also gathered outside her home and yelled epithets at her. Sarah Sanders went to a restaurant in Virginia with some friends and when the waiter approached her to take their order the manager asked them to leave and threw them out. These protesters call the people they protest against Nazis? They should look in the mirror. And to think this all started because they lost an election and still can’t get over it. 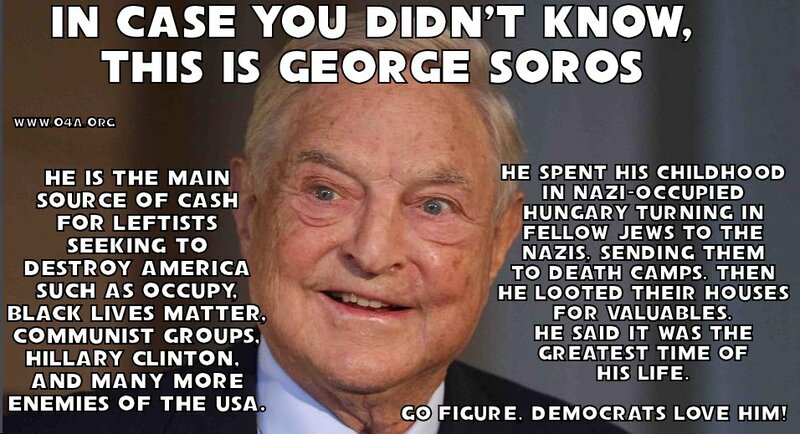 I see two names in the back of all of this, Soros and Obama. Frankly, I give Hanoi Pete NO Pass. He expressed himself clearly and he CANNOT take it back. He may be forgiven if he, perchance, turns to the Truth and stand for that cause; but simply admitting “going too far” is not enough. That he believes lies, is founded upon his false precepts – no one’s fault but his own. If you seek the Truth you will find it. If you spread lies the Truth will find you (you cannot tell a lie unless there is Truth to tell it about). Then, whatever judgment it passes upon you, you will likely find to be hell! Go smoke another bong, Pete!